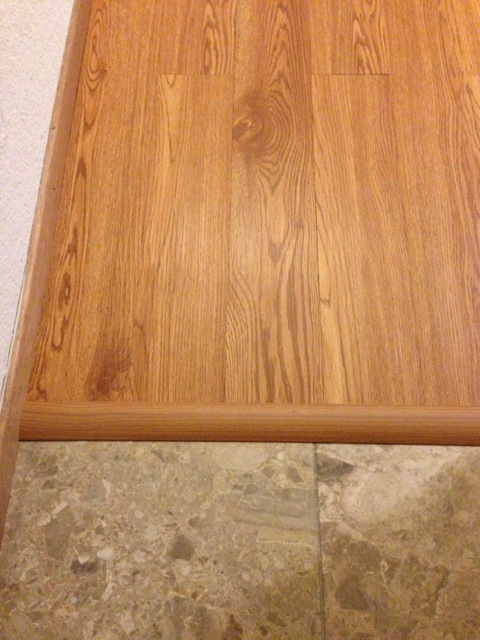 My house was built in the 1980s and had a composite flooring material that looked like fake wood planks. Unfortunately, whatever the top layer was had started to chip, discolor, and wear away in patches. 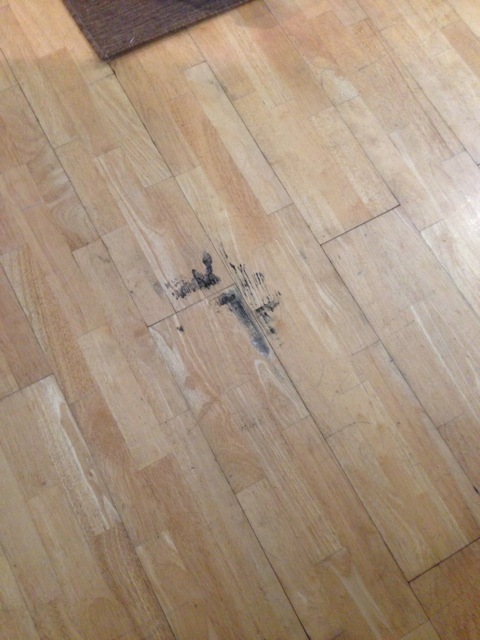 The floor was highly scuffed and scratched. It also had some mystery stains that I could not get out. I started to suspect they were actually scorch marks because there was some slight bubbling in the finish. We didn’t want to spend a few thousand on a new hardwood floor, or deal with the mess of ripping up all the old boards. I did some research online and found a lot of good reviews for the Style Selections vinyl plank flooring at Lowe’s. (The older reviews call it Novalis Peel and Stick). At first I was skeptical that the vinyl would look like cheesy printed plastic sheets, but after taking a look in person I was sold. 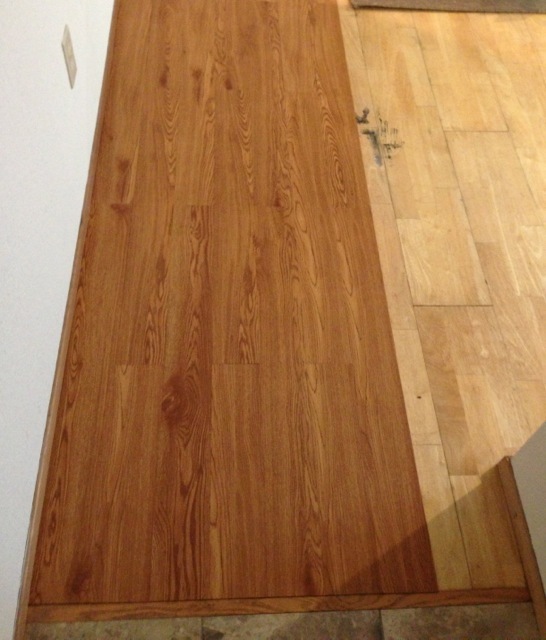 We used the “Style Selections 4-in W x 36-in Luxury Vinyl Plank” in the “Golden Oak” color. (There were also lighter and darker shades at the store but I felt this was the most realistic-looking). 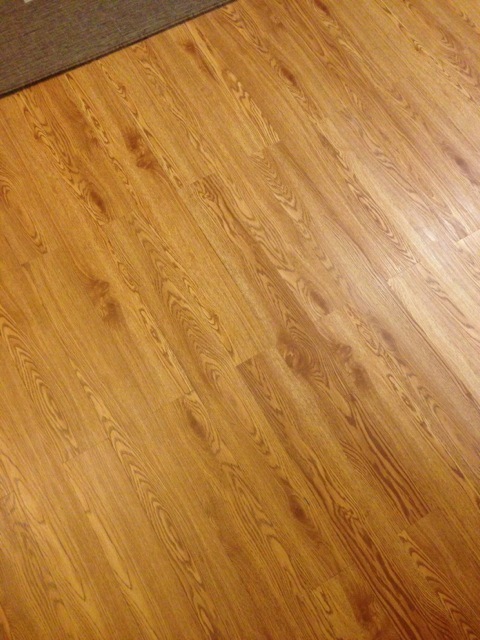 The surface was textured with a wood grain pattern. Best part? It’s peel and stick! That meant I could lay it on top of my existing floor. Also, instead of moving everything out of the living room I could shift the furniture around as I worked. Here’s an in progress shot to show the difference between the new flooring (on the left) and my old flooring (on the right). I apologize for the funny lighting. I took these with my iPhone at night, because that’s when I did a lot of the work! The vinyl is about 2 mm thick and thin enough to cut with sturdy scissors or an Exacto knife. This was good because I had to cut some rather oddly-shaped pieces to go around door frames. Putting down the pieces in the middle of the room went very quickly, but going along walls took more time than expected due to the fact that I had to cut very specific shapes. The living room is a central hub, with entrances to multiple rooms, which meant lots of doorways. My husband had to cut and nail down a lot of carpet bars! Here’s a doodle I made of the irregularly-shaped room before I went to buy supplies. (That’s my desk, not the floor). I don’t have a picture of a big empty room showing all the flooring at once, because I never had to take out all the furniture. Here’s a shot of the finished area shown in the progress photo. We have had a number of visitors who were impressed by how much it looked like real wood. It took two of us several days (not working the entire day). If you had a square room without a lot of doorways I think you could get it done in one day with some help. Lowe’s sells the planks in singles or boxes of 30 planks. I bought an extra box just in case we made mistakes or miscalculations, but ended up having enough to redo my closet as well! I’ll discuss the closet more in a later post, including how I built the shelves. – Since it’s plastic and can expand slightly due to temperature fluctuations, leave the boxes in the room you plan to do the installation in for 24-48 hours beforehand. – Vacuum and mop thoroughly before and during the installation. The boards won’t stick very well if there’s dust. My husband and I also went over each area with a rag right before putting down a board. – Buy knee pads! You can get cheap foam ones for $5/pair but do it! – Go over the planks with a heavy rolling pin and also shimmy around on top with socks to make sure they stick well. – Some of the reviews I read recommended putting down a floor primer first to improve the stickiness. I didn’t use it because my floor was already pretty smooth, but I think it would have been good for the closet, which was plywood. So, what did all this cost? The planks were 98 cents each (per square foot). I bought 270 of them, plus 2 pairs of knee pads. I also had a 10% off coupon, and a gift card I purchased at a discount. I spent $252.04 at Lowes, plus about another ~$65 at OSH buying 3 faux wood transition bars, 1 gold metal carpet bar, a metal stair protector and a hack saw. 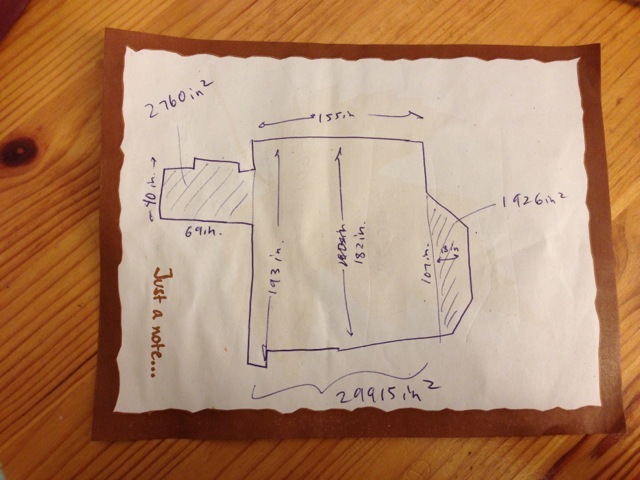 About $300 for a brand-new living room and closet floor that looks like it cost a lot more? Yes! 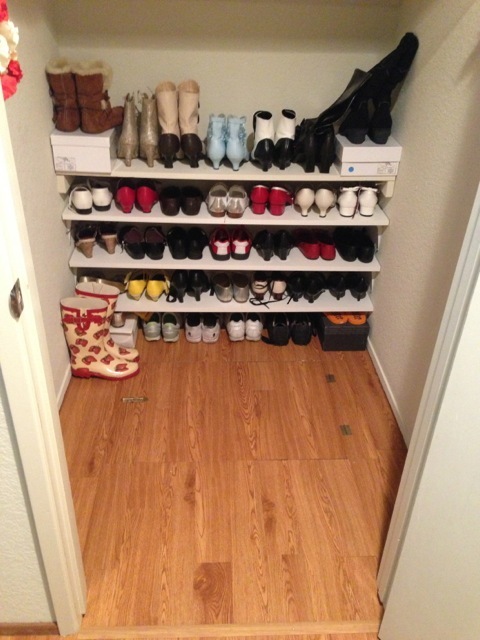 Posted in Home Decor and tagged flooring, home improvement, inexpensive floors, vinyl floor. Bookmark the permalink. I was thinking of going the laminate route as we need to redo our condo floors. Our Japanese Spitz has a tendency to water the carpet in the living room. I find my floor much easier to clean now so I definitely recommend it! Just put this down and love the look you get for the price. I was wondering if you could tell me how you are cleaning the flooring? Im wondering what type of cleaner is safe for it? Hi Anonymous, for some reason I couldn’t reply directly to your post, but I use Murphy Multisurface floor cleaner. I dilute it before use (1 part cleaner, 3 parts water) and use a spray mop and pad so that the floor doesn’t get too wet. Hello, I just found this post. We are considering this flooring, but I would love to know how it has held up since it’s been almost 2 years that you’ve put it down. Thanks for any advice you can share! Hi Kathy! Most of it still looks like new. 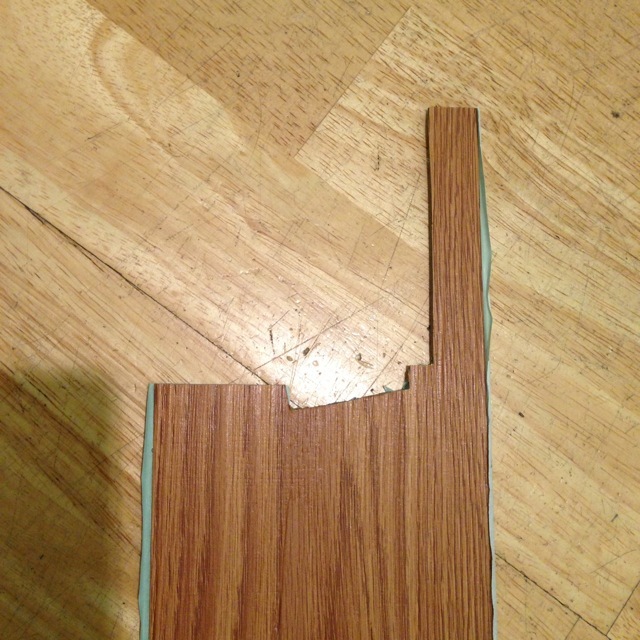 I had two boards peel up at the corners, but I think the floor underneath was a bit uneven there. Since I had an extra box, it was really easy to pull up the boards and stick on new ones. I’ve heard of people putting down a floor primer first, although I didn’t, but you can try that if you have concerns about peeling. I would definitely buy a spare box for future repairs just in case. I’m very happy about how it is holding up. I don’t have pets, and my baby isn’t walking yet, so I don’t know how it’ll look in a few years, but right now it’s still an investment I’m glad I made. why not just sand down the original floor and refinish? 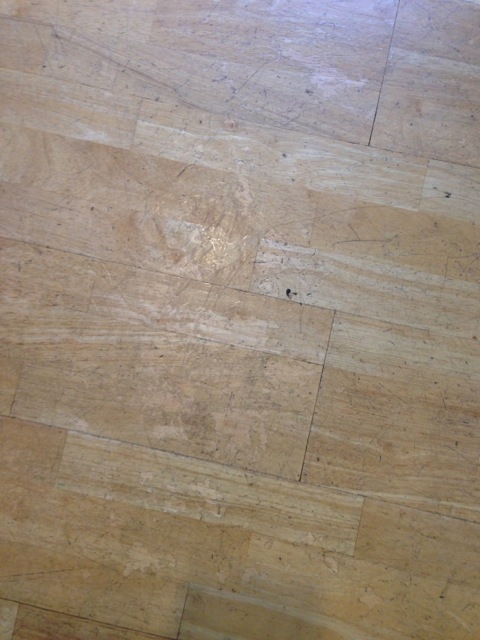 Unfortunately our original floor was not real wood, but some kind of composite material, so we could not sand.